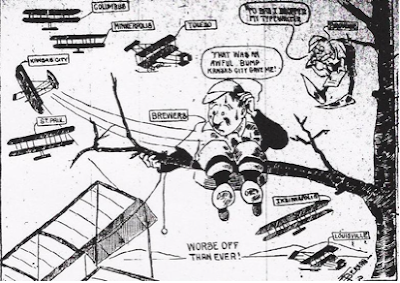 Our moment in Brewer history "100 years ago" took place early in the month. The second day of June to be exact. It involved an event that we today would find commonplace, but was in its time rather unusual. But to let us know the nature of the man involved in the story, we will need a few extra lines. Both the incident and the man are clearly from a different era. On June 2, 1912, the sixth-place Brewers played the final game of a series in Kansas City. On this day Brewer pitcher Cy Slapnicka was pitching masterful ball for 11 innings. The 26 year old Cyril Slapnicka had been acquired by the Brewers shortly after the season began. Slapnicka, from Oxford Junction, Iowa, was purchased from Rockford of the Wisconsin-Illinois League, where he had posted a record of 26 and 7 the previous year. The right handed spitball pitcher had also been the second best fielder in that league, with a .977 fielding percentage, in addition to a batting mark over .250. 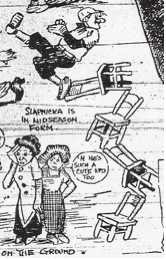 Late in the 1911 season Slapnicka had been sold to the Chicago Cubs, posting a 0 and 2 record. Chicago later released him to Louisville of the American Association. The Colonels returned him to Rockford. The "Athenian prince" or "Grecian Blonde", as the local newspapers would often refer to him, would end up with a 12 and 13 record for the Brewers in 1912. He was also a fine hitter. The next season Cy was leading the league in hitting around Memorial Day (.370—10 for 27) and in the later part of August was hitting .295. Slap was used on occasion as a pinch hitter, his managers' confidence in his hitting was so high. On this June 2 afternoon in Kansas City Slapnicka's spitball was working flawlessly, allowing the Blues only three clean hits and two scratch hits, while fanning seven, through 11 innings. However, the score stood tie at 4 to 4. The major damage against Cy was in the sixth inning. 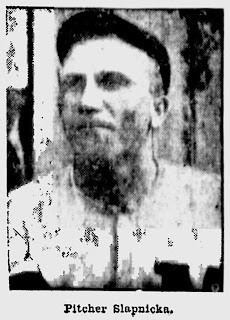 Kansas City first baseman Carr hit a long ball to left field and as outfielder Jimmy Breen turned to chase the ball, he wrenched his knee so badly he was absolutely helpless. The hit became a three run homer. In the last of the 12th Slapnicka walked a batter, who went to third on a double. Slap then uncorked a wild pitch, scoring the winning tally. Blues win, 5 to 4. The Milwaukee Journal's Brownie gave a little more detailed, and entertaining explanation of the inning. Having exhausted all earthly forms of rotten, bone-headed ball playing, the Brewers sprang a new one which will probably go down into history as the first case of its kind, at least in the American Association, when, in the twelfth inning, they reached up into the skies and grabbed an alibi in the form of a passing aeroplane. Up to the appearance of the birdman in the sky, Slapnicka had been pitching wonderful ball. He had just fanned the first man up when the birdman was sighted by the crowd—who craned their necks until everybody was doing it, including Slapnicka. As a result, he lost the location of the plate, and the next man up walked. Nearer and nearer came the birdman, and Slapnicka became so interested that he slipped one straight to Schaller, who poked it up against the bull in right field, earning $50 and a two-base hit. By that time the bird man was right over the grounds. Probably jealous of the way the fellow handled himself and his craft while up in the air caused Slapnicka to do a little aerial stunt all of his own by cutting loose one which never stopped going until it had hit the grand stand and the winning run was allowed to score on a wild pitch. I am fairly certain a low flying airplane over a stadium would be cause for "rubbernecking" even today (not to mention security after 9/11), so imagine what a scene it created a hundred years ago. And to let us think of how different the era was, let us take a look at what Cy Slapnicka did in the off season. There was no "Dancing with the Stars", or Made-for-TV movies, or guest appearances on sit-coms, so theater was the main form of this type of entertainment. In the off-season Slapncika performed a vaudeville act. His act was juggling. He was booked into March of 1913, and was forced to cancel some acts so he could report to spring training on time. This does not sound too serious for a ball player, and little was made of it. But the act came to the Brewers' attention more carefully the following year; apparently Cy added a balancing routine to the show. He signed a contract to perform his "voodvile" at The Empress, located at 748 North Plankinton Avenue, just north of Wisconsin Avenue, in the heart of Milwaukee's downtown theater district. "Slapnicka is going to show the public that it is just as easy to balance chairs, lamps and tables with his good twirling arm as it is to strike out Minneapolis batters. Slap is successful as a pitcher, a saloonist, and a vaudeville actor. One of the local fight clubs will sign him up pretty soon". [This off season Slapnicka had opened a "thirst emporium" on North Third Street off of Wells Street [215 Third Street, later address 819 North 3rd Street]. Tom Dougherty, another Brewer pitcher, was employed in the off season "handing out wet goods to the patrons of Slapnicka's booze emporium". Once the vaudeville act was actually seen, things became a little more serious for the Brewers and their fans. Reading the review of the opening night performance one gets a mental picture of Slapnicka's part in the vaudeville, titled "In Old New York". Most ball players who break into vaudeville are disappointments as actors. Not so with Cyril Slapnicka, "Milwaukee's pennant winning pitcher", who is appearing as an added attraction at the Empress theater. Except that he appears in his ball uniform, Slap makes no confessions that he is not a really and truly an actor. The act consists of a series of equilibristic feats with kitchen chairs and tables. In one stunt he piles three tables and several chairs into a tower like structure, and balances himself on top of the rear legs of another chair. Life in New York's East side is well set forth in George Hoey's sketch, in Old New York…. The Milwaukee Sentinel did not think much of Slapnicka's stunts on the stage. The hearts of the baseball fans are in their mouths this week. 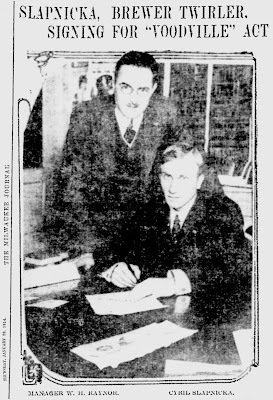 Some of them go so far as to say the management of the Milwaukee baseball club should obtain an injunction or take some kind of proceedings to prevent Cyril Slapnicka, "the pennant winning pitcher" from appearing in vaudeville. What right has he to endanger the pennant chances of the club next summer by putting life and limb in daily peril? If he must go into vaudeville, to pick up an idle dollar or two, why couldn't he be content to follow in the footsteps of Mike Donlin and Rube Marquard, and tackle something safe and easy, like singing or dancing, even if he couldn't do it? Neither can they. Why, in short, must he pick out something so dangerous as his trick of balancing on the hind leg of a chair topping a pyramid of three other chairs and three tables? Not content with that, why must he give every one heart failure by that fall from his lofty perch? It may be a good climax to the act. No one disputed that, but it also raises a question or two for the fans to worry about. What would happen to Milwaukee's chances next summer if Slapnicka were to fall and break that precious arm of his? It's a chance the he takes at least three times daily. The show did its scheduled one week run, apparently to the delight all many, except the Brewer management. The Brewers were thinking of going to court to stop Slapinicka's act, being afraid he would injure himself permanently. However, management found it would be legally impossible to stop Slap. According to the Milwaukee Journal Slapnicka was much better on the stage than most ball players, commenting this was "about the first time that the fans have seen a real ball player that can do a legitimate vaudeville stunt. Slap is surely not getting the money on his baseball reputation, as he turns out an act that is worth the money". One weeknight Brewer catcher Johnny Hughes appeared on stage as Slapnicka's assistant. When Hughes appeared on stage he looked nervous and missed his cues twice. "It was a cinch that Johnny would have felt a great deal more at home if it was bean balls that Slap was throwing at him rather than chairs." Brewer president A. F. Timme attended this show. As Cyril balanced himself on the top of three tables and as many chairs, the head Brewer was filled with fear for his star twirler. "But when Slap finished up his act with a smile and Johnny Hughes got off the stage without a miss, Timme breathed easy and said that he could now understand how Slap could be so cool in a pinch on a ball field". At least in Milwaukee, Cy did not perform vaudeville after the 1913/1914 off season. On October 21, 1914, Slap married Miss Abbie Josephine Martinek at Cedar Rapids, Iowa. The couple honeymooned on the Pacific Coast and then made their home in Cedar Rapids in the off season. For the time being Slapnicka still owned the drinking/eating emporium in downtown Milwaukee and teammate Newt Randall "dishing out suds" in Cy's absence. However in the spring it was reported Slapnicka had disposed of his café and would devote himself entirely to baseball. Slapnicka would pitch for the Brewers through the 1917 season, in total winning 78 games and losing 73. His best season in Milwaukee was the 1913 season, when he won 25 and lost 14.